We’re not going to sugar coat it – building an email list is time consuming and costly. Today, email marketers looking to build their database need to work in tandem with the entire marketing team to ensure campaigns are running, landing pages are converting and brand awareness is increasing. 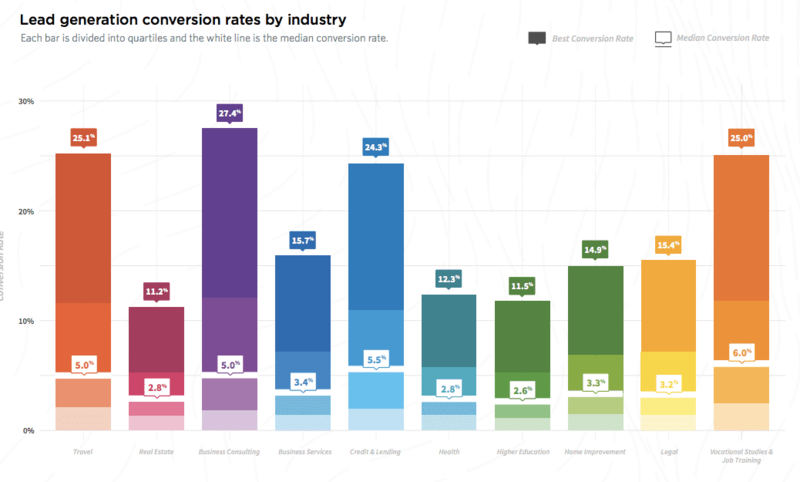 Considering the fact that the median lead generation conversion rate ranges from 2.8% in the real estate industry to a ‘whopping’ 6% conversion rate in the vocational studies and job training industry, even when campaigns are running well, the time it will take to build a substantial list is still longer than any email marketer wants to wait. So why not buy lists instead? If you’re a law-abiding citizen, which we hope you are, you should know that buying email lists is illegal. Thanks to a little thing called the CAN-SPAM act, it’s illegal to send individual emails if they have not opted in to your mailing list and given you explicit consent to send them marketing material. Email consent is also a big deal under the GDPR, so if you need to be compliant with the new regulation, you need to make sure each recipient opts in to your email list, otherwise you risk incurring heavy fines. Buying email lists doesn’t come with a guarantee that the lists will be high quality with leads that are relevant for your industry, or that the leads are even real. If you don’t mind risking the law and still want to buy an email list, you might be surprised at the number of hard and soft bounces that you will encounter. Since email servers today are smarter than they used to be, they might see this behavior as that of a spammer (but more on that soon). If you buy an email list (against our best warnings) and the emails by chance happen to be real ones, you still don’t know if they are actually relevant to your company. Even if the leads are real, it won’t help you to have a million emails of individuals who would never buy your product or service. Having a list composed predominantly of men when you’re a maternity clothing brand won’t really help you, and having a list of EU citizens when you only offer US shipping will have the same value – which is none. As open rates decline, engagements will decline, further damaging your brand reputation, IP reputation (more on that later), deliverability and campaign effectiveness in the short and long run. Getting one unsolicited email is annoying. Getting dozens of unsolicited emails is downright upsetting – and when people get upset, they hit the dreaded “spam” button which is pretty much the worst thing for an email marketer. If a recipient marks your company email as spam, your hard thought creatives completely bypass their inbox, ending in the spam folder, and effectively rendering all email marketing efforts useless. If a few recipients miss out on your creative emails and witty subject lines, you might not worry too much, but if too many people mark you as spam, you should start worrying. Being marked as a spammer could lead to your entire domain being blacklisted which means no one will get your witty emails. Even if not blacklisted, being a spammer can cause irreparable damage to your IP reputation, reducing deliverability and inbox placement and damaging your entire email marketing operation. If single email sender from your account is blacklisted, it may affect all other emails on the same IP, and as a result, many ESP/SMTP vendors block such senders. If factoring in the time it takes to find an illegal list, make the transaction and craft the email that will ultimately yield lots of bounces and trigger spam filters, and add to that the sheer cost of the list, you end up with a big and unnecessary expense in your bottom line. Instead of spending that money getting relevant leads to grow your database the right way, you will end up wasting time, energy and money for your company, ultimately reducing your profit and your ROI. While buying a list may seem like the quick and easy way to boost your database, the long term damages of such an action can have a more detrimental impact on your brand in the long run than is worth risking. Even if you buy a list and use a completely separate ESP/SMTP vendor to check them, and only use the clean ones, you will still have little information about the recipients profile, impacting your ability to hyper-segment and improve campaign effectiveness over time. So at the risk of being redundant, we’re going to say it again – don’t buy email lists. Spend the time, energy and funds to build your subscriber list the right way. That way you will know that the leads you have, though not as many in numbers, are the right ones for your business and have the most chances of improving your brand engagement, reputation and ROI.